Watching the responses to the riots and the behaviours they have demonstrated, I have come to the conclusion it is how they were brought up. How can anyone who has been brought up in a loving household do what they have done and are continuing to do? The Judges who have been passing sentences on behalf of the Cameron Government to those involved in the riots last week were mostly (if not totally) middle class Oxbridge educated white men. 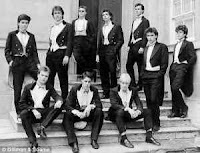 At a guess, quite a few of these, just like our Cabinet Ministers, suffered at the hands of the disgraceful Private Education System, and by having just too much money..
David Cameron, a man who has little to look up to, and acts that way, is a perfect example. Thrown into care at the age of seven (in Heatherdown Preparatory School), he excelled in his academic work, but made terrible choices in his private life. He got into trouble over drugs and fell in with a bad crowd. Any working class boy at that time (circa 1980) caught as part of a cannabis dealing ring as has been alleged, would have went to court at the very least. The thing about this is; his family were minted, so even though he was part of a crowd who regularly smashed up commercial premises or set fire to them, he managed to scrape by without the equivalent of an ASBO. But why the trouble in the first place? Surely there was no lack of male role models? Yes - an absent father and mother, but surely the institution into which he had been incarcerated at such a young age had lots of men teaching and gardening and cleaning up after him... hmmm... perhaps the fact the role models were cap doffing and relying on the Cameron family dosh explains a lot? I wonder what he thought of those who bowed and scraped and laughed at his stupid jokes? Did he realise they were wanting to please so his family would not stop paying his way through their place of work? The trouble with those who have been fabulously linguistically educated is they brilliantly, eloquently speak and write absolute drivel, though well hidden in the fat, trite words. 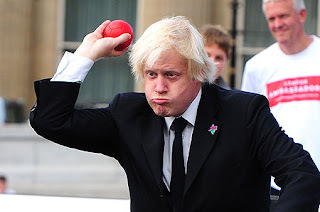 More and more I listen to the Old Etonian gangs who are in power speaking in calm, measured tones, telling us using almost poetically, which makes it oh so convincing- the most illogical mince you could imagine. 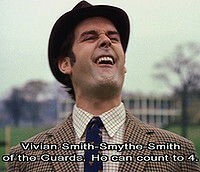 "Sir Causal Dyslexic-Moronicham, what do you think caused the riots?" "Oh, most empitatically superfluent wibbleness and Huber-octacolly rubellanestically jumpulagressively evil lack of morality and hoodies. Jail them all for 50 years and pour me a G and T, theres a good chap!" Now, when these morons speak, because we have been tuned to think posh accents and fat words are good, and working class accents, and smaller words are less good, people defer to the posh accent. Listen to Boris as a prime example of a prat saying nonsense in a posh way and then getting his way! These poshos who have been brought up by teachers and nannies and who have been told by all around them, "Oh Tarquin, your mummy and daddy would be so proud!" (if they weren't out shooting some dopey animal that has been bred to fly into their gunsites in order to be praised by the paid lackey who collects their killings for them) have a problem. When these people, educated to think they are never wrong- and educated not to think beyond the FACT they are better by the sheer FACT all in sundry around them doff the cap and clean up for them and tell them how wonderful their night with the Buller men, blowing up toilets must have been, then you end up with people who are devoid of empirical logical empathetic thought. Listen to how these so called educated arseholes speak to each other. It is all about linguistic upmanship. Presentation, rather than any empirical evidence. Prime Ministers Question Time in the UK is all about that- and Cameron is the worst at it. When he can't answer a question with a rational answer, he resorts to name calling. It's how they talk to each other from the moment they are thrown out of their house by their drink sodden parents and into boarding school to the day they are carried out of the House of Lords. The ruling class (because that is what we have again after a twentieth century in which there had been a little progress in having working class representatives) are calling for army on the streets; teenagers to be locked up for months and months on end; Wembley Stadium to be a huge, holding centre and there are calls to make poor people even poorer by slashing their benefits and turfing them out of their homes. Also- these poshos have jailed people who said something silly on Facebook for four years; someone with no previous convictions who stole a bottle of water for six months and all sorts of other serious over reacting (weird how the racists from the BNP or EDL who post on Facebook are never arrested). Boris Johnston said it is foolish to give economic and sociological explanations to understand these riots. Listen to Boris as a prime example of a prat saying nonsense in a posh way and then getting his way! Perhaps it wasn't poverty that made him set buildings on fire and trash businesses. At a guess, his income wasn't slashed, nor his home taken from him and he certainly was never given a custodial sentence. And as for Nick Clegg, the arsonist who went on to be the Deputy Prime Minister nodding dog... I wonder can any of these men empathise with their victims or with those who committed similar crimes last week? Clegg, in a radio interview certainly could not see the similarities to his own larks at setting other people's property alight. They became the trouble makers they are only by chance of birth. It isn't their fault surely? To understand the ills of our society, one has to look at how these arseholes view us, and in turn treat us and perhaps relate it to the diabolical way they were brought up. The disdainful language they use to describe working class people has turned from the language of demonization (Chav, Ned, Oik.Pikey etc) to the recent description of protesting youth both during the student protests and last weeks riots as "feral scum" (feral is a word used to describe animals - a word for a section of our society that describes them as animal - less than human. We exterminate feral animals. Dangerous times or stupid words?) through to how they truly believe that "we are all in this together" - them directing the theft of our taxes to pay off their banker chums and their "mistaken expenses" and us coughing up with barely a peep. Don't forget Cameron was found to be wanting during the expenses robbery, but instead of him "doing time," he got off with paying it back. Perhaps that option should have been given to the 23 year old woman who had NEVER had a previous conviction - who had NEVER been let off the hook for a drugs offence and trashing restaurants - who was handed a six month jail sentence for stealing a bottle of Evian. Turf them out of Number Ten, I say. Cut their benefits by imposing a 70% tax on their massive incomes and judge them harshly on the harm they are meting out on working class people across Britain. Or perhaps I am just an inverted, intolerant snob who can't see that they really need our help?